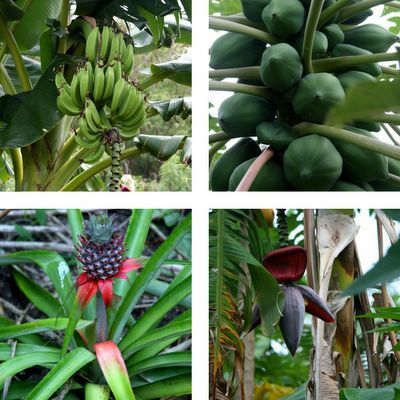 If you are one of those people who tries to eat locally as much as possible, the chances are that, unless you live in a tropical climate, bananas, papayas and pineapples are not on your menu often. If you visit somewhere tropical like Fiji, those fruits you consider to be exotic become the norm. At the end of two weeks, you might even find yourself longing for a plum, a fig or a strawberry. These photographs were taken on the island of Kuata in the Yasawas. PS. Please consider supporting our efforts to raise money to help Unicef's efforts to send earthquake relief to India and Pakistan. Anyone who gives a donation will have the chance of winning a great prize. Read more details about each prize package here: For Bay Area locals we have The Ferry Building Bonanza and the Hungry Bay Hopper. Our International readers might like the chance to win some fantastic food books from the Bay. Nice shots, Sam. I'll say that I aim for organic more than local, but I do have access to local bananas: my neighbors have an apple-banana tree that hangs its fruit over into my yard! Actually, I'm not even sure they know it's there, but I'm not about to complain about it. I just checked Nic's profile to see if I might wander over and "find" some local apple-bananas (the best). Los Angeles. Darn. Your tropical pictures (and descriptions) are a great respite from the wintry mix outside here in NYC!